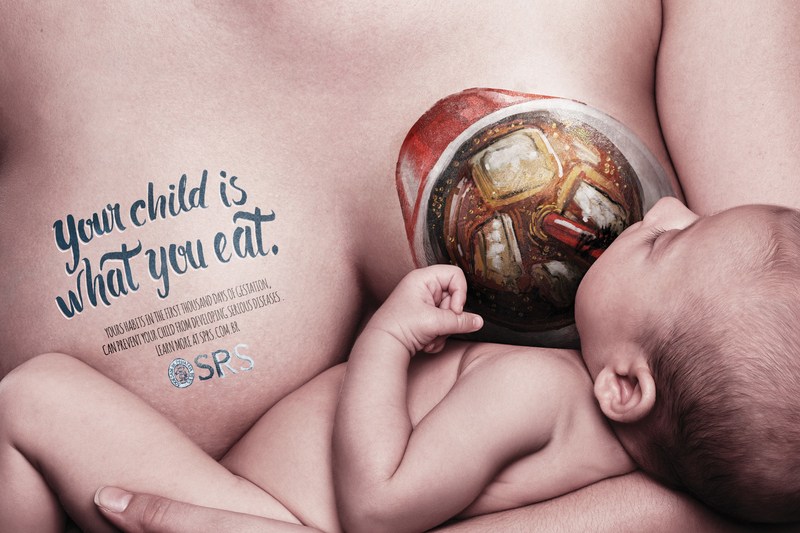 You may recall the advertising campaign developed for the Paediatric Society of Rio Grande do Sul (SPRS) in Brazil by an agency called Paim. A blogger on advertising in Brazil has conducted research to find out the messages people took from the campaign. There were three advertisements, that were reproduced on the Daily Mail website and picked up around the world. 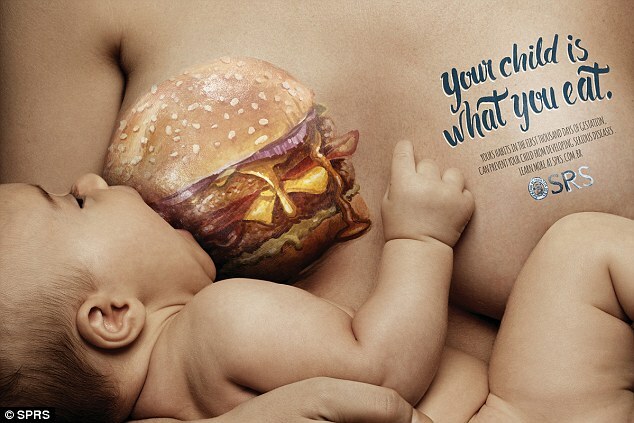 The advertisement states: “Your child is what you eat. Yours habits in the first thousand days of gestation can prevent your child from developing serious diseases. Learn more at sprs.com.br“ [sic: text on the English version of the advertisements shown on the Daily Mail and other websites]. Francine Lima asked followers of her blog to answer a questionnaire on the campaign. We were not consulted on the questionnaire and came across the results by chance. The respondents were asked to choose from nine statements all that they judged were the correct interpretation on the images (or add their own). Between 21 and 23 September 2015, 352 people responded. The results are shown in the graph below, available on the original Portuguese blog here. Mothers who breastfeed must never eat junk food. ~90. A mother who drinks a soft drink and breastfeeds is giving the soft drink to her baby through her breastmilk. ~ 80. Mothers who breastfeed eat a lot of junk food. ~30. [When a mother eats junk food, the baby likes the milk more. – not shown on the graph, presumably as not selected by anyone]. The researcher suggests that the majority of these respondents understood the campaign as intended by SPRS and suggests only a minority of 13.3% saw the campaign as undermining breastfeeding (the figure of ~50 out of 352 respondents). The researcher incorrectly suggests this alone was Baby Milk Action’s (IBFAN’s) criticism of the advertising campaign and that some of the 13.3% were responding having read my blog on the campaign. Our concern about the campaign was broader than this. 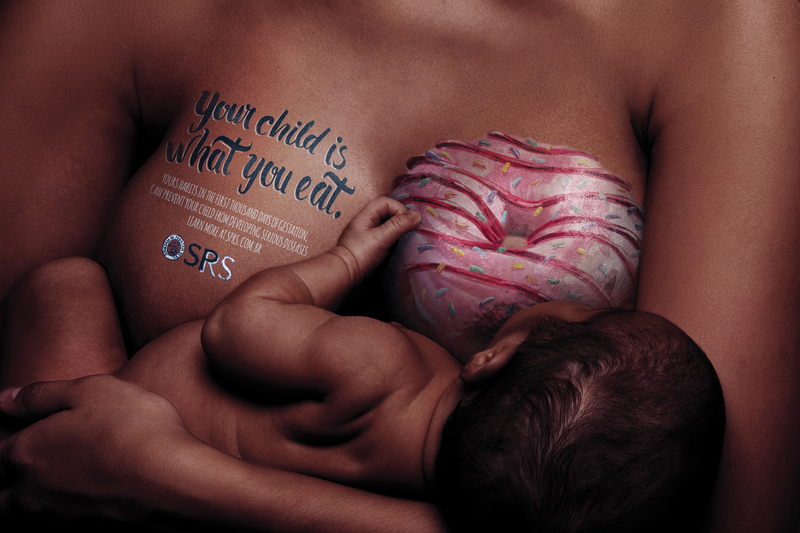 The message “Your child is what you eat”, is too simplistic, particularly given the images accompanying the text. I think this research substantiates our concerns. The messages some are picking up from these advertisements are either simply wrong or make breastfeeding seem particularly demanding. About half of respondents selected the option “Everything a mother eats goes into her breastmilk”, and more than half thought the message of the campaign is, “Mothers who breastfeed must eat well to ensure their babies will be healthy”. Of course, we should all eat healthy diets, but the negative message that eating a hamburger or drinking a soft drink could harm your child is not necessarily the most effective way to encourage either healthy eating or breastfeeding. We appealed to the designer of the campaign, José Pedro Bortolini, who commented on my first blog to listen to the concerns before the campaign was launched. He didn’t and the campaign was launched in Brazil shortly afterwards. The designer is interviewed on the advertising blog (in Portuguese) and continues to defend the campaign, even in light of these findings. He says it is very positive that the English version of the campaign was reported around the world. Do these results reassure you about the campaign or cause you concern? Do you think the approach of Breastfeeding USA is a better approach to ensure more babies get the best start in life? That confirms exactly what I thought about the adverts. I showed some of my friends and they said the same, we all felt it was inadvertedly anti breastfeeding! I think its awful that the designer did not listen to the concerns, and wonder what Jose thinks now? I agree. I think it’s confusing and sends out the wrong messages to mums. Clearly people have interpreted it in different ways also. Ashame a breast was used as so many other images could’ve made a better point like a child watching a parent eat junk food from the womb or as a toddler. As a public health nurse and lactation consultant, I found the ads very alarming. I meet a lot of women that already feel that they are not doing enough for their babies. 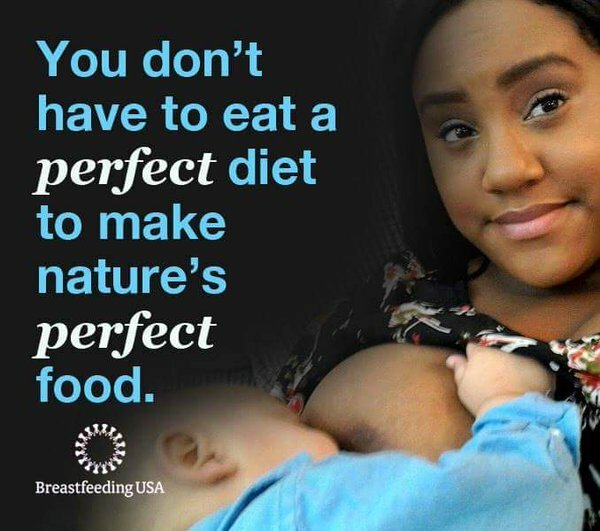 This is a very defeating message in a society that already makes breastfeeding difficult considering the heavy formula campaigning that is done in Canada. My first impression was that there was a formula company behind this (and I still suspect there is). I hope the campaign is stopped. The message implicated is not only untrue, it is unethical in it’s simplicity. It is very difficult to completely adhere to a purely healthy diet. The advert is putting a lot of pressure on the breastfeeding mother which can make her feel like she is not doing enough for her baby and just give up on breastfeeding. I live in a country that has a lot of young mothers who may find this a reasonable indication to stop the already socially challenged BF upon ‘realising’ that they are ‘not helping’ their babies. I do not know if this was the intention behind the advert but the message I get is, “either you avoid certain foods and BF or if you can’t avoid those foods, do not BF”.